To better understand all the aspects and components of scientific research activities, this book explores and discusses the research indicators applied for research evaluation and their categorization. The present chapter provides a broad overview of what this book comprises and its main assumptions. Specifically, researchers particularly scientometricians till now have not identified a single scientometric indicator that reflects the overall impact of a research output at any level of evaluation. 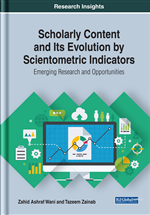 The categorization presented that has been provided in Chapter IV of this book illustrates that the scientometric indicators do not capture the impact of scientific research fully rather they partially reveal the research impact. These scientometric indicators signify the research eminence at different levels like Impact dependent over time, age, and career-length; Impact dependent on quantity of publications; Impact normalized to field etc. Thus the approximate overall Impact of research at any level can be assessed only when the scientometric indicators are used in combination that provides information on different aspects of scientific output (Van Leeuwen, Visser, Moed, Nederhof, & Van Raan, 2003). In the same way Bollen, Sompel, Hagberg and Chute (2009) are of the notion that scientific output is multifaceted and multidimensional, which could not be evaluated by a single indicator although some measures are more suitable than others. In this context, scientometrics offers range of indicators for gauging and evaluating the performance of different aspects of scientific entity (publication, researcher, research group, research organisations etc. ).Martin (1996) is also of the view that since scientific activity is multidimensional hence it is not possible to measure it with single indicator. Though there is a high demand by the science professionals that performance should be by a single/aggregate indicator which they can handle and maintain themselves but scientometric literature hardly provides such aggregate indicators. Further, that the assessment of scientific activity and publication performance cannot be represented by a single indicator as it is unwise to use citations as a proxy of research quality or publication count as the bearer of research impact. The use of various indicators with complementary features provides a more comprehensive analytics of scientific output. Thus using a single indicator to assess the literature is inappropriate. On practical basis, it is always sensible to use more than a few indicators to measure research performance. A single number can never give more than a rough approximation to an individual’s multifaceted profile. Therefore, it is necessary to choose more than one indicator for an unbiased and even scientific research assessment and evaluation.